But ExxonMobil said something close to that the other day. 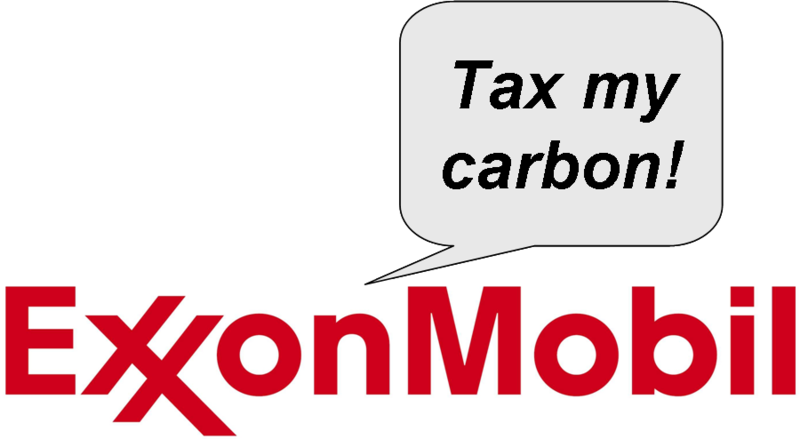 Exxon states that a carbon tax is more predictable and manageable than regulation. The big news is Exxon’s implicit recognition of society’s right to regulate carbon. (Thanks for helping that along, Justice Roberts.) For sure, it’s a political calculation. Nonetheless, it’s a damn sight better than opposition. There may be a deal to be made. That’s better than a war to be fought. I’m not getting all aflutter just yet, though. Exxon is a long way from committing to any particular tax. Consorting with Exxon and other fossil fuel giants is anathema to a lot of people. Bill McKibben is mounting a crusade against the fossil fuel companies modeled after the civil rights movement. I share his frustration and anger at Exxon’s long history of obstruction and doubt-mongering on climate change, and support what he’s doing. But in the long run, people have to agree to change their behavior. That includes artificial (and very powerful) people like corporations, as well as the real people whose livelihood depends on them. It also includes the people who reap the benefits of fossil fuels—which is to say, anyone who drives a car, heats a home, turns on a lamp, browses the Internet, or eats bread. We didn’t fight a second Civil War to end racial segregation (though there was some horrible violence). We got agreement. We raised consciousness. We decided collectively that the present system was deeply immoral and destructive, and that we couldn’t behave that way anymore. The civil rights fight has largely been won. Justice remains incomplete, but at least no one can openly advocate for segregation any longer. We’ve all seen people we regard as “conservative” sincerely outraged at instances of racial prejudice. Society has indeed evolved in that regard. Fossil fuel companies use their unsurpassed economic and political power for short-term gain at the expense of the right of humanity to live on a sustainable planet. But there are two profound differences between the civil rights movement and the movement to shift off fossil fuels that will limit the utility of this approach. One is that oil is the predicate of the world as we know it—the world of international trade, large-scale agriculture, cars, electricity, and instantaneous communication. Not a convenience, not a supplement, but the sine qua non. No substitute is as energy-dense, transportable, and chemically protean. Oil is the basis of Western life and prosperity, whether we know it, admit it, like it, or not. Segregation was a gratuitous, volitional, and behavioral phenomenon that was a big drag on the country’s well-being and success, short-term or otherwise. The other is urgency. We have to wring 80% of the carbon out of our economy in less than 40 years, maybe a lot less, or accede to our own destruction. Civil rights was a long battle won by persistence. It had no deadline. McKibben is pushing divestment of fossil fuel stocks—a tried-and-true tactic of social protest that was particularly effective against apartheid in South Africa. As a symbolic gesture, it has great power. As a practical matter, it is useless unless we all use less. It is nonsensical to divest our institutions of a stock that we continue to support with our consumer behavior. The math just doesn’t work. Without Exxon’s cooperation, how are we going to remove 5.1% of the carbon from the economy per year? That puts them out of the fossil fuel business and strands their billions in investments in the ground (e.g., oil and gas) and on the surface (e.g., pipelines, gas stations, and refineries). On top of that, the economic ripple effect will be like an economic tsunami that washes not just over them, but us. Think of removing 5% of the carbon from the latticework of the American economy year after year, starting now. Five years in, we’d be at a 25% reduction in fossil fuel use. How is that not equivalent to a 25% or greater reduction in economic activity? To a 25% unemployment rate? The time frame is simply too compressed. We cannot replace that power, watt for watt, in that short a time frame, even if we employed every out-of-work man and woman to attack every wedge in the Pacala and Socolow decarbonization plan, from conservation to nuclear. What will it take for Exxon to agree to abandon their primary business and all the money invested in it? For them to make the same sacrifice we’ll have to make? I have an idea I’ll share next week.